Meanwhile, a medical team is racing to help J50, a starving 3 1/2-year-old orca in the same family. As Tahlequah carries her deceased calf for a 17th straight day, and concerns mount about her health, taking the calf away is not an option because of the tight bond between Tahlequah and the rest of the pod to her baby — dead or alive, experts say. “These are very intelligent animals, and the loss of this animal is quite profound for the matriline and everyone who witnesses it,” said Sheila Thornton, lead killer-whale scientist for Fisheries and Oceans Canada. She saw Tahlequah continuing to carry the calf Tuesday as J pod traveled south to the outer coast of Cape Flattery, Wash. 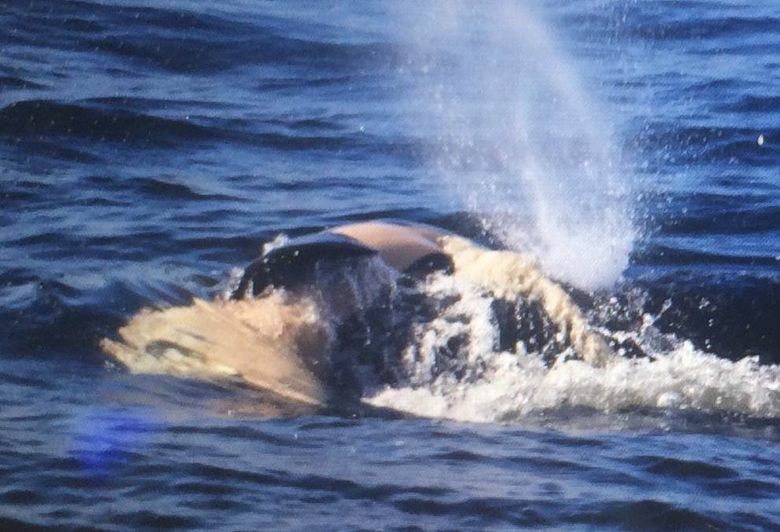 It is not known if her family is foraging for her and feeding her, Thornton said, and she could not get a good enough look at the orca from the water Wednesday to assess her condition. Meanwhile, biologists and veterinarians mobilized Thursday in an attempt to prevent more losses in the imperiled J Pod family, with J50, age 3½, feared to be near death from starvation. The orca may also have an infection. The initial plan was to take the fish from seiners or reef netters, a maneuver the Lummi practiced Monday with success. But catches of chinook are too unreliable for both people and whales to get enough fish for J50; at least 15 hatchery fish will be transported for the whale, with more in reserve. People from around the world are following the trials of the southern-resident orca clan, down to only 75 animals.